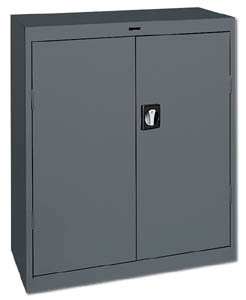 Compact design counter height cabinet represents top of the line construction for any cabinet series. Features two fully adjustable shelves with raised bottom shelf and contemporary three point recessed locking handle. Heavy gauge steel (22 ga.) construction meets ANSI/BIFMA standards. Available in Putty, Dove Gray, Black, or Charcoal -- please specify. FOB Shipping Point.